Great Engineering - Techmaster Inc. The Numatics lapped spool and floating sleeve assembly is a matched set, machined from stainless steel to millionths of an inch precision. 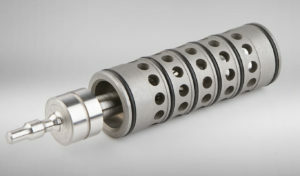 It’s patented, balanced construction relies on an air bearing principle, eliminating troublesome dynamic o-ring seals. The sleeve remains stationary in the valve housing, floating on six static seals. The sliding spool is sealed simply by virtue of the close finish tolerances. With the spool floating on a film of air molecules, there is no metal-to-metal contact. Heat-treating of spools and sleeves gives a hardness necessary to combat pipe scale and other air line contaminants. The spool is balancedwith respect to air pressure, and offers extreme versatility of valve application. It supplies true multipurpose construction. The floating sleeve insures freedom from any mechanical distortion imposed on the valve body. Lubricated or properly filtered dry air will insure longer life; however, the spool and sleeve’s unique design, inherent resistance to contaminants and sticking, will provide years and years of troublefree service, exceeding industrial standards of design and performance. All these factors give the Numatics Spool and Sleeve a reliability and long service life which have been field proven in maintenance-free operation, typically outlasting the life of the machine on which it was installed. 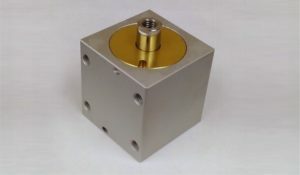 Both Spool and sleeve are stainless steel, precision machined to close tolerances. They are a matched set and spools are not interchangeable. Air enters the sleeve, and the matched fit allows minute leakage across the spool. This centers the spool in the sleeve and acts as an air bearing. There is no metal-to-metal contact. Sealing is accomplished by the closely maintained fit between the spool and sleeve. Air bearing principle allows all valves to operate dry: without any lubrication. Vacuum to 300 PSIG independent of pilot pressure. Full backpressure at any port does not affect operation. There is no blow-by to exhaust during spool shift. Consistent valve action independent of pressure or vacuum. Razor sharp edges on the spool are a perfect shear against the holes in the sleeve to fight air contaminants. 2 Micro inch surface finish on the outside diameter of the spool and inside diameter of the sleeve make it difficult for air line contaminants to adhere. Static o-ring seals float the sleeve in the body, eliminating binding caused by temperature changes or uneven torque of the mounting bolts and pipe fittings. 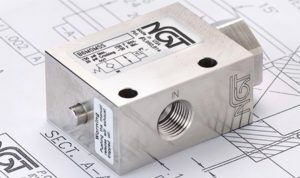 NGT’s patented balanced design reduces the force required to open the valve. The traditional ball and poppet pilot check valve require large pilot pistons in order to open the main seat. The pilot piston force must overcome the force resulting from pressure trapped behind the main seat. 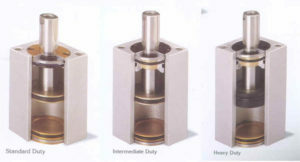 Large pilot pistons cause high operating forces that decrease the life of the valve. A typical ball type or poppet type check valve with the same flow area as the balanced check will have 16 times the force required to open the valve. Opening a valve seat with 44 lbf for 10 million cycles would cause significant wear, as opposed to 2.7 lbf for 10 million cycles. The air cushions on both ends of the pistons also help to reduce wear due to impact forces when the balanced piston shifts. The absence of a large pilot piston translates into a small design package. Compare our 3/8 nptf Midget Model with the competitions for size and flow. To repair, remove the endcap, insert a new cartridge and replace the endcap. This can be accomplished in a few seconds without removing the plumbing. 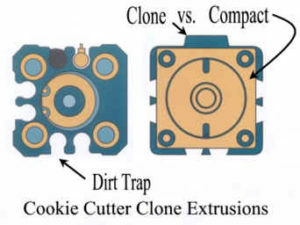 Simple Extrusion: The basic extrusion is plain to increase design options and eliminate some of the problems with cookie cutter clones. Patented End Cap: Cross-sectional profile exposes more of the piston surface to air pressure at the beginning of the stroke. This gives the cylinder a faster response. The design also provides a self-cushioning effect to lessen noise. Free-Flowing Port Orifices: The direct orifices (no turns or angles) deliver a large air volume at any pressure. This improves cycling rate and responsiveness. 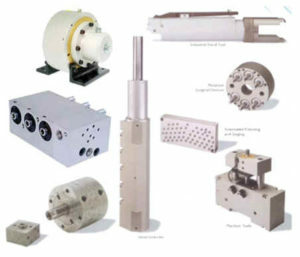 AccuGrainTM Manufactured Bores: All cylinder bores are first diamond-honed for roundness and then work-hardened for smoothness. This process produce a super low friction surface with outstanding lubrication retention. 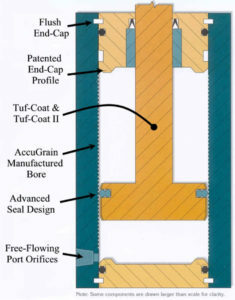 Advanced Seal Designs: The “figure-8” piston seals are made of Buna-N have a low breakout friction, low running friction, longer life, and positive sealing. Tuf-CoatTM Husky Piston: The extended-length piston in heavy-duty series cylinder features a proprietary Tuf-CoatTM fluoropolymer piston surface coating. The surface has very minimal break-away force, and a large bearing area that prevents scoring: without the use of thin wear strips. 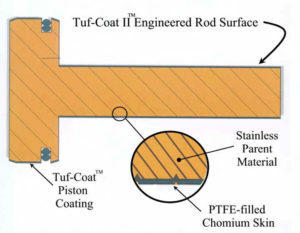 Tuf-Coat II TM Engineered Rod Surface: The rod surface finish features the highly refined Tuf-Coat II TM PTFE filled chromium on stainless steel with a hardness of Rc72. Standard Duty: Typically 60% smaller then conventional cylinders with the shortest overall cylinder length for a given stroke. Intermediate Duty: Deeper end cap bushing for improved side loading. Heavy Duty: Deeper end cap bushing and longer piston for maximum side loading. This piston also has the proprietary Tuf-CoatTM piston coating. Modifications: Compact Air has over 10,000 files of modified special cylinders: From simple porting changes to 100% custom designed cylinders.